It is the time of year where we are thinking about our summer holidays and planning for the care of our pets and I am starting to get questions from concerned owners who want to do the best for their cats so I thought I would jot down some advice. There are a couple of options but remember, there are no rules but it is important to do what is right for your cat, and you. First of all, please never leave a cat home alone. There are various things that could go wrong in the home and also, if the cats picks up an injury, there will be nobody there to help. I know you can buy feeders which are on timers etc but personally, I don't think this is fair - cats are not completely no-maintenance animals. They are very sensitive little souls and can be easily stressed. You could ask a family member, friend to stay at your house (that is my preferred option). This is great for nervous cats who don't like strangers, or change, as they are in their own home with someone they know. This is MellyBoys favourite as he gets spoilt by "Nanny" or "Auntie Nikki" and he is never really that bothered that I am away! You could also consider asking a neighbour to pop in to feed and check on the cat. However, you need to be aware that some cats do not cope very well with minimal company. I guess it depends on your usual daily routine with the cat, but this can be an option for some people. I would definitely choose someone who loves your cat and is prepared to spend a little time, at least twice a day giving the cat a bit of love and attention or just simply some company. This may be an option for a short weekend away but I wouldn't personally, do this for more than one night with MellyBoy - he loves company and gets a bit stressed out and bored if he doesn't have a human slave to amuse him - when he is in the mood of course! The other home option, is to employ a pet sitter. There are lots of people advertising their services. Some are "house-sitters" who will live full-time in your house, others are "pet sitters" who pop in and out. If you decide to go for this option I would ask family and friends for recommendations and if you can't get that, contact a few people, ask for references, and insist that both you and your cat meet them before you book to ensure you are all a match - A bit like hiring a nanny I guess! The other option is a boarding cattery. Like with most businesses, there are great catteries and there are awful catteries so my advice would be get recommendations and visit the cattery before booking. Any decent boarding facility would be more than happy to give you a tour. As a protective pet owner, I felt terrible the first time I went to visit a cattery for MellyBoy and I thought it looked like a horrible prison and I imagined him being terrified and feeling abandoned. However, I had a great tour, a long conversation with the staff and I ended up booking him in. He coped very well with the experience and so, in emergency situations, I would take him there again. Are cages facing each other? For some cats this can be stressful. They may have quiet corners for very nervous cats. Is the cage big enough so the cat has space and the feeding and toilet area are far apart? Does it smell OK? Obviously, there will be smells but it shouldn't smell "bad"
Do the cats get petted, played with and held? Are the cats monitored at night? If your cat is on a special diet/medication can they work with that? You can also speak to them about home comforts, can you bring in your cats own bed, blanket, toys even Feliway plug in etc. Personally, I find leaving MellyBoy quite stressful, he is a very easily upset little cat who is a bit of a "Mummys Boy" so I worry about him alot. 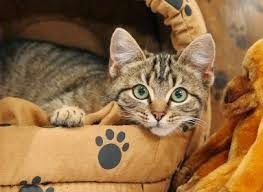 My first choice would always be to have a friend or family member stay in the house but, I have seen that even MellyBoy coped with a cattery so the option is there if I ever need it. Really useful:thanks! We haven't stayed away since our feline overlords arrived. Don't know who'd be more upset if we did - us or the cats. We'll have to at some stage though, and this will be a help.